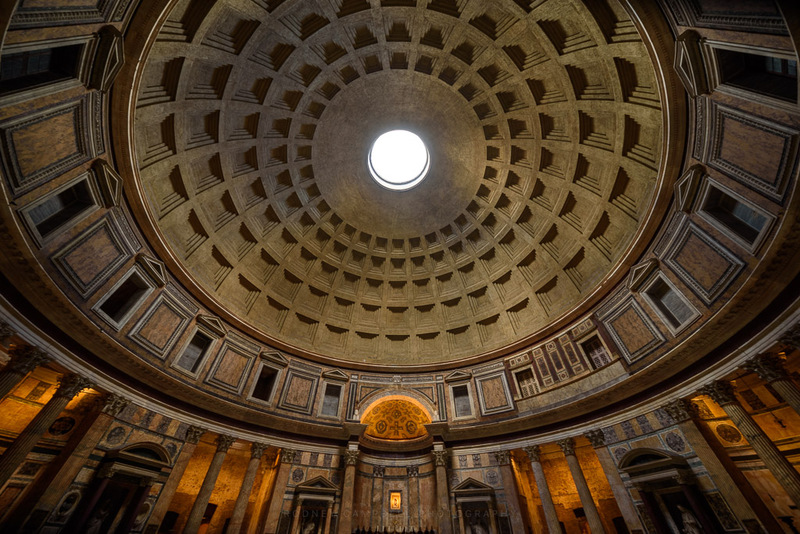 Even today, almost 2000 years after its construction, the Pantheon is a remarkable building to see. 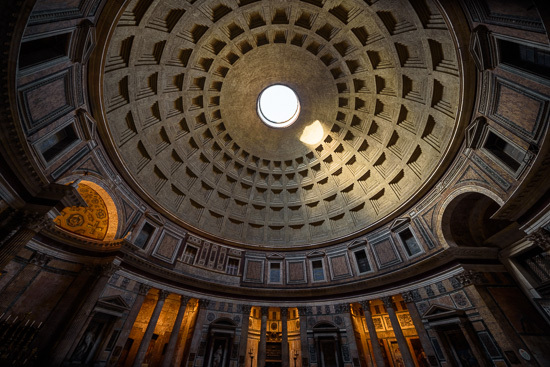 It’s a striking reminder of the architecture of the great Roman Empire. 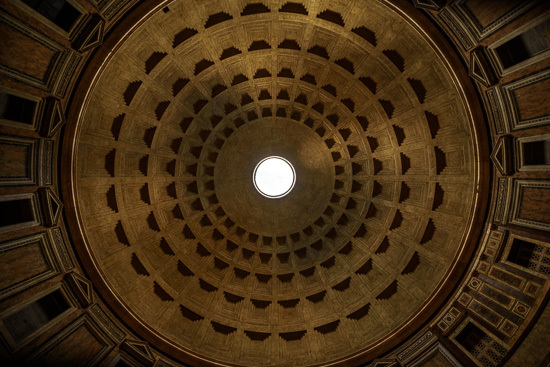 The most fascinating part of the Pantheon is its giant dome, with its famous hole in the top (the eye of the Pantheon, or oculus). The dome was the largest in the world for 1,300 years and until today it remains the largest unsupported dome in the world. 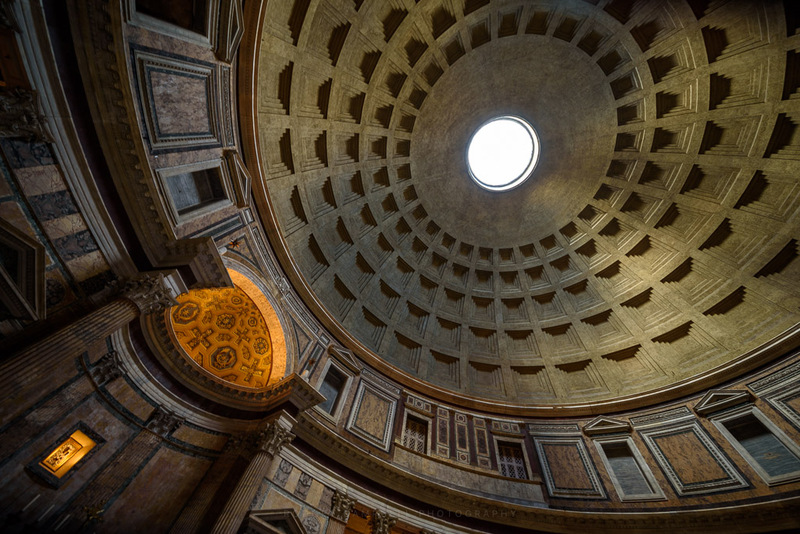 The dome is 43.3m (142ft) in diameter and is in perfect proportion with the Pantheon by the fact that the distance from the floor to the top of the dome is exactly equal to its diameter. The hole (oculus) is 7.8 meters in diameter and was the only source of light. 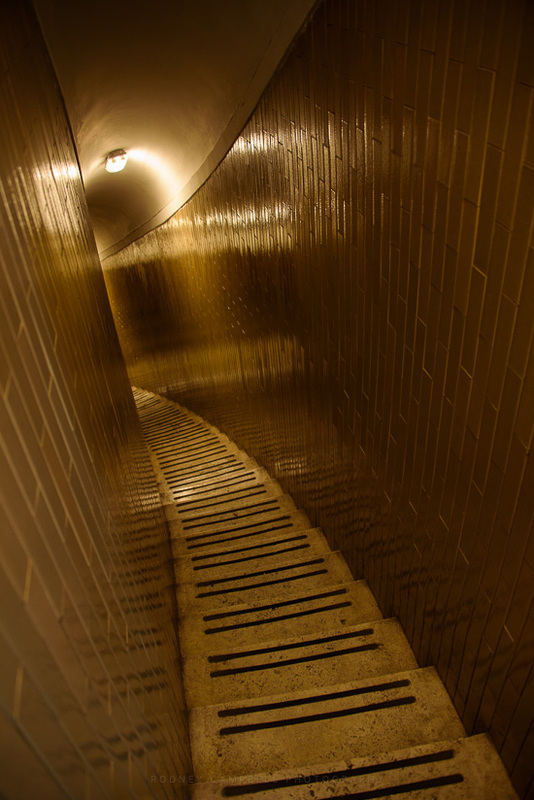 Rain occasionally falls through it, but the floor is slanted with drain-holes which drains the water if it manages to hit the floor. 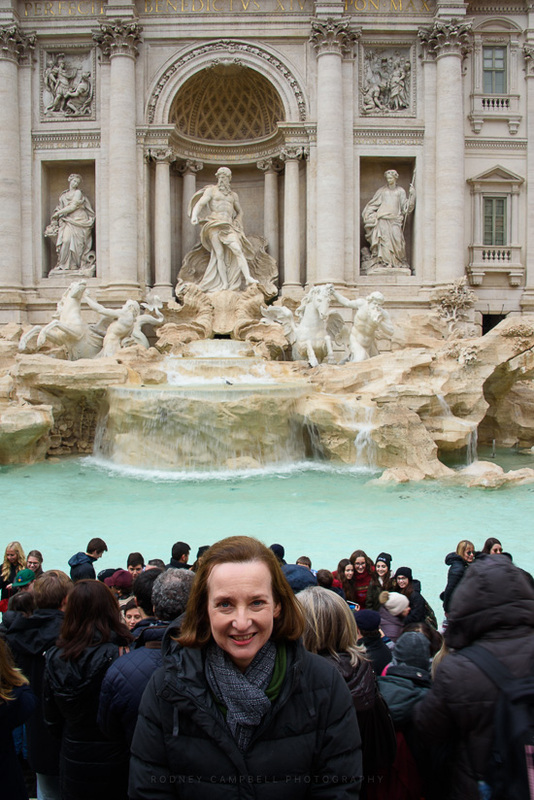 No trip to Rome is complete without a visit to the Fontana di Trevi, or Trevi Fountain. 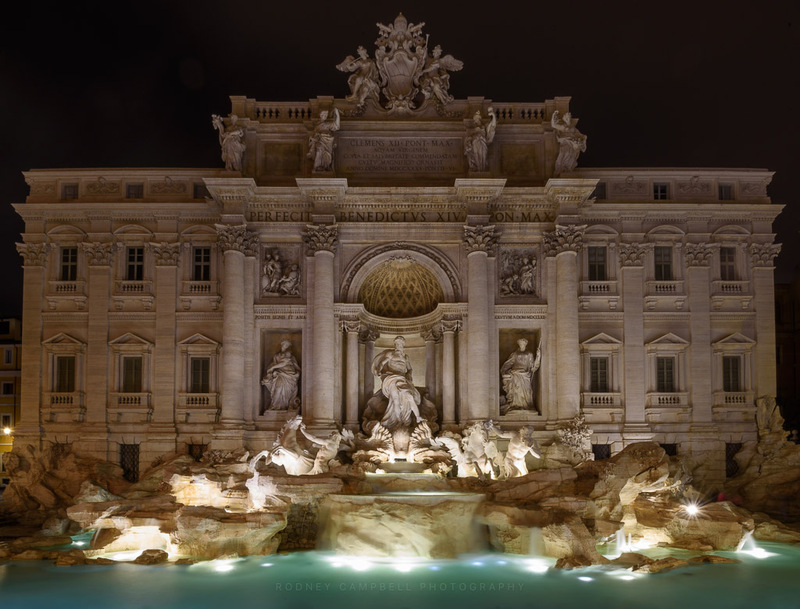 One of the most famous fountains in the world. 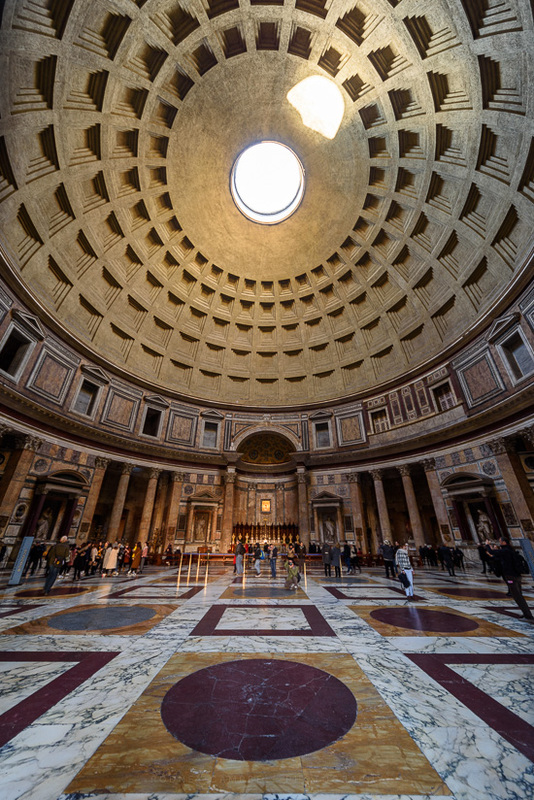 I’d come back at night (with all my kit) to hopefully shoot it without the pandemonium of the daytime crowds. Unfortunately even after 9PM at night there were still a large number of people here so I had to choose my locations (and use of long exposure :)) carefully. The fountain dates back to ancient Roman times and is mostly built from travertine stone (the same material as the Colosseum). When the fountain is open roughly €3,000 is thrown into it every day as people follow the tradition of throwing coins over their shoulders. 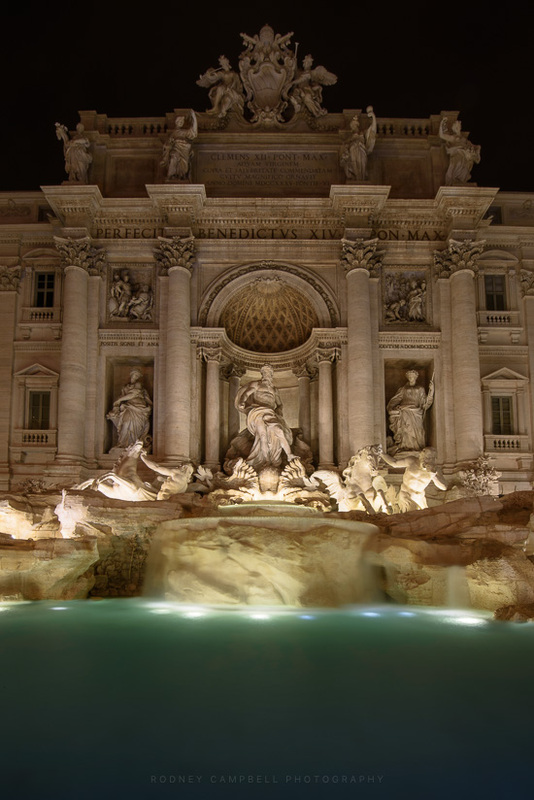 The legend holds that a coin thrown into the fountain will ensure a return to Rome. This tradition also dates back to the ancient Romans who often threw coins in water to make the gods of water favour their journey or help them get back home safely. 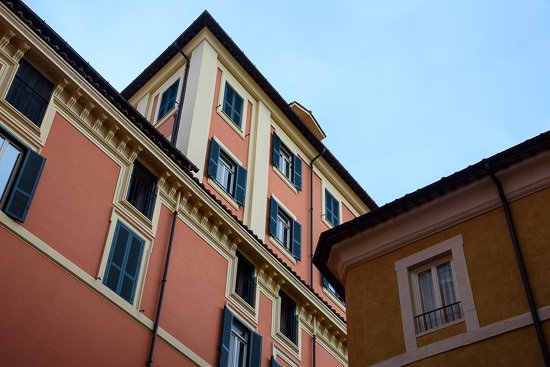 We of course complied when we all returned here on a later day. I actually think there were less crowds here when I brought the whole family back at 9AM the next day. 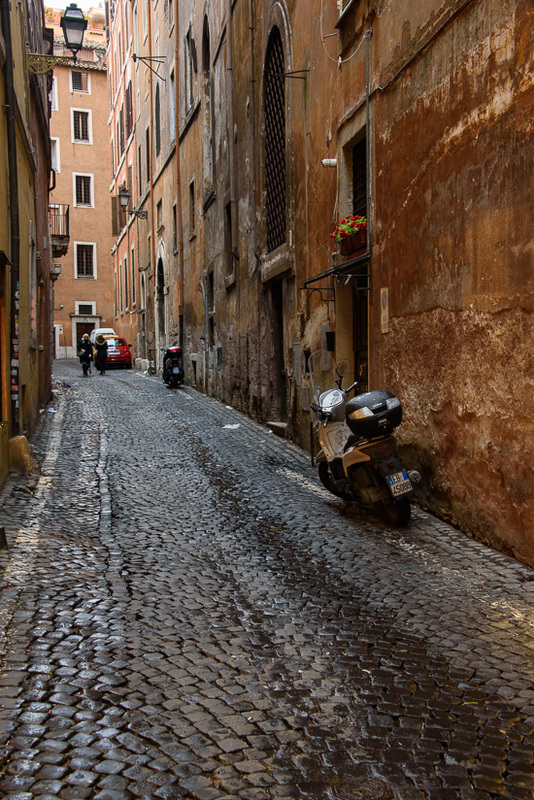 In the afternoon Louise and I went wandering in the streets of Rome whilst the girls vegged out back at the apartment. 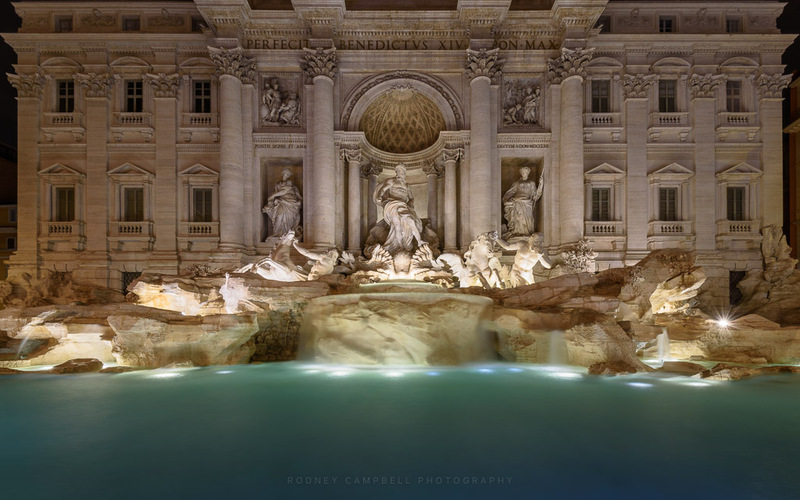 The ever so famous Trevi fountain (which was 5-10 mins walk from our apartment). 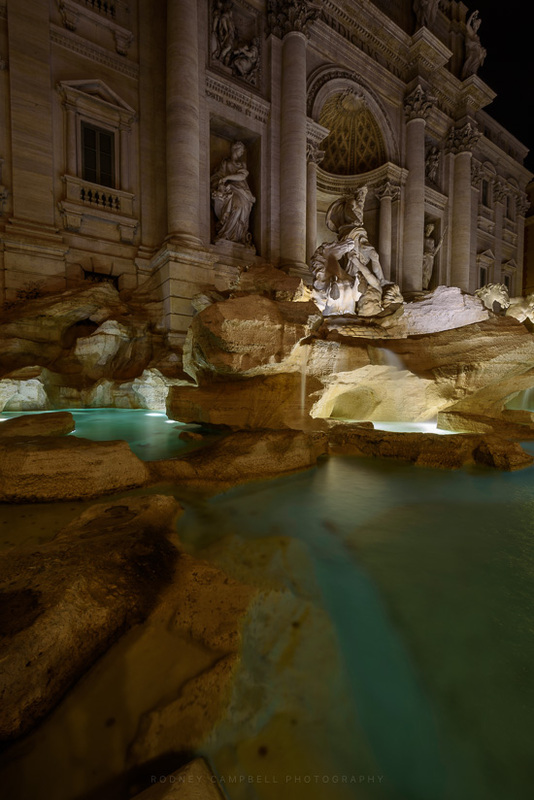 I’d come back here later at night (with tripod and filters) when the crowds weren’t so insane :). 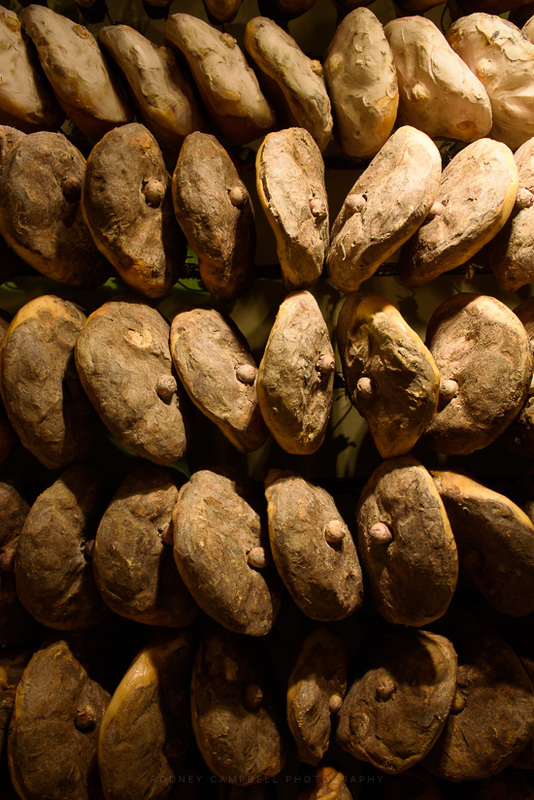 Everywhere interesting stores with interesting food 🙂 (ham’s if you were wondering). 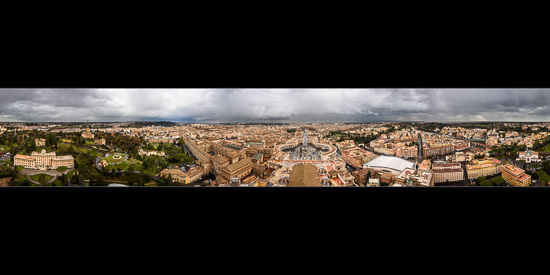 A single tight frame of just the square, the river Tiber snaking it’s way across and the city beyond – taken from the top of the dome before heading back down all those stairs and into the square. Our girls are somewhere down that street leading to the square :). 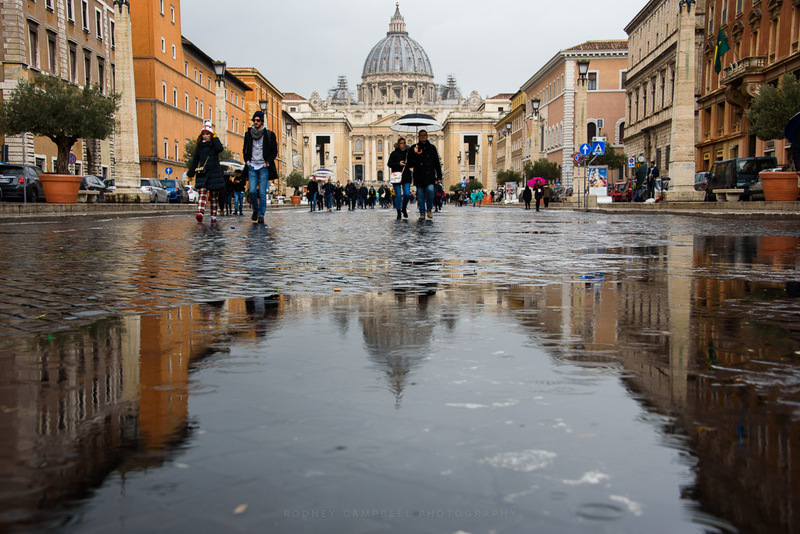 It was another rainy day here in Rome – thankfully the weather improved a little over the coming days. 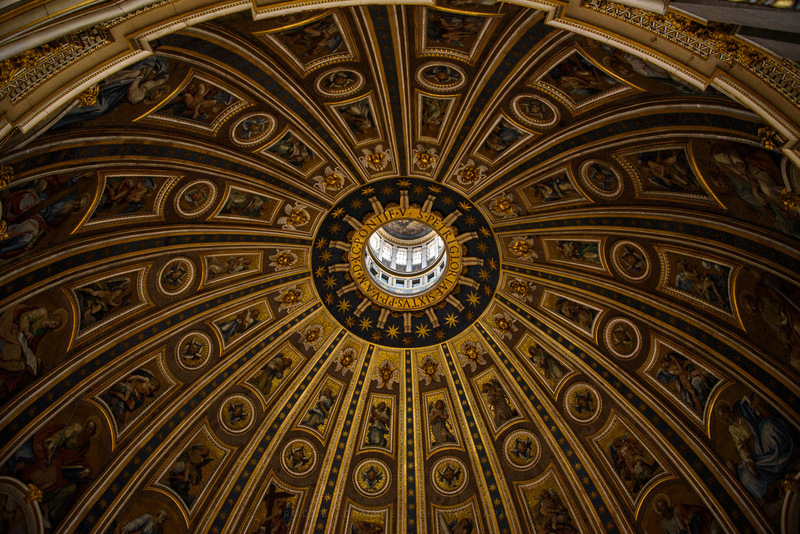 When climbing St Peter’s cupola (dome) your options include taking the steps all the way (551 steps) or a lift part of the way (320 steps). 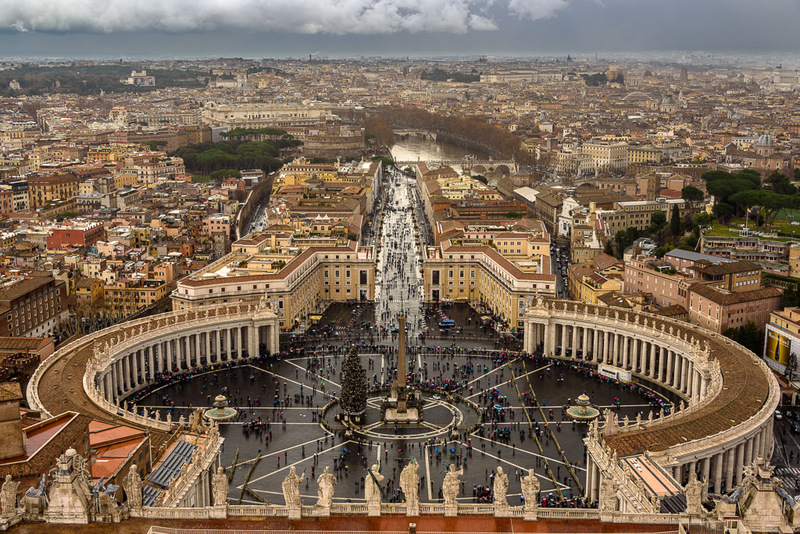 Once at the top, you have 360 degree views of St Peter’s Square and the city of Rome. 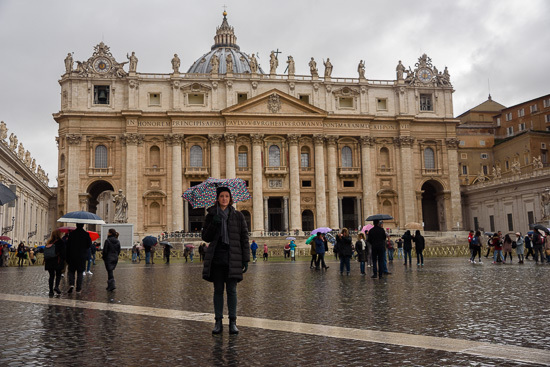 Our daughters had had enough of churches already and decided not to climb the dome and opted instead to head to a cafe. My wife and I chose the lift option and then the climb (which was still pretty significant :)). 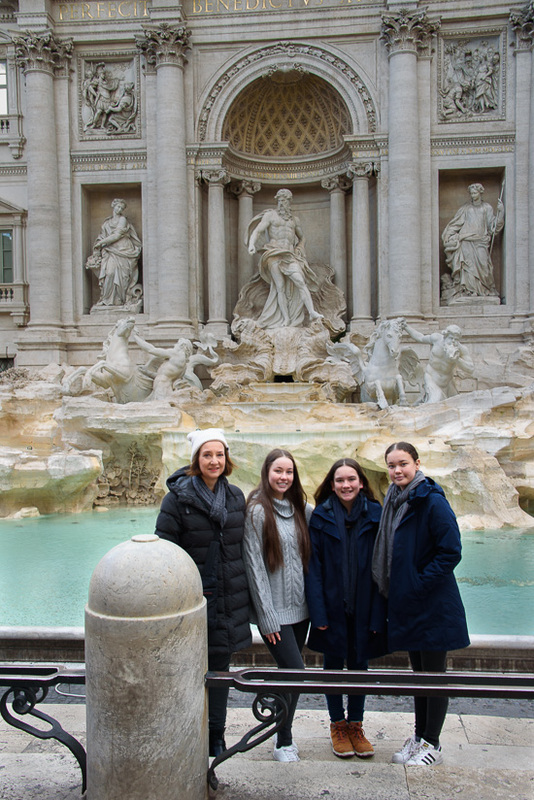 The view from the top was incredible – well worth the €8 and the climb – our girls totally missed out. Walking around the viewing area at the top you get clear unobstructed 360° views of the city of Rome. Above we have a full 360° view from the top – a handheld stitched panorama consisting of 20 frames with the D-SLR taken whilst circumnavigating the dome top. 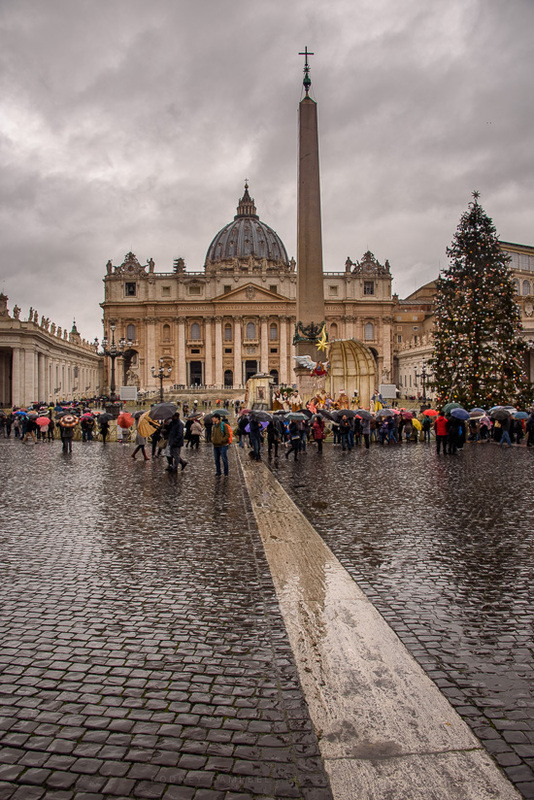 Even the ominous moody sky with dark black clouds and some rain suited the scene. 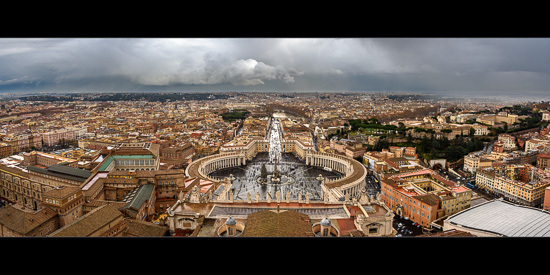 Below a stitched HDR panorama consisting of a sequence of 3 lots of 3 frames looking straight down over St Peter’s Square (which is of course round and not square :)).